Many of you who read our blog posts, from The Carriage House Inn Bed and Breakfast, know of and have visited Old City Cemetery, in Lynchburg, VA. A unique spot in Lynchburg, it obviously started out as merely a cemetery. Funeral customs in the 1800’s encouraged family, friends and others to spend time in the cemetery “visiting” the departed, sharing picnic space with the departed, caring for the gravesites and enjoying a place of peace and beauty. Today Old City Cemetery is visited in much the same way. Every time we visit there are people walking the grounds, visiting the various grave sites, enjoying the roses, trees and plantings, taking time for quiet reflection at the fish pond, swinging in the giant swing hanging fro the pecan tree or learning about the cemetery by visiting the village of small museums or participating in a tour. 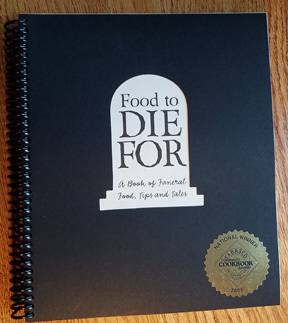 The book Food To Die For A Book of Funeral Food, Tips and Tales, by Jessica Bemis Ward was first published in 2004. Published as a fund raiser, 100 percent of the cookbook’s profits have benefitted the cemetery. Initially the profits were allocated toward the building of the cemetery’s chapel and columbarium, which were completed in 2006. Since it’s first publication more than 16,000 copies of the cookbook have been sold, raising funds for various projects throughout the cemetery. The more than 100 recipes found within the pages of the cookbook are for comfort foods, the types of dishes taken to bereaved families or relatives. Chapters include casseroles, main dishes, soups, vegetables and side dishes, breads and desserts. The recipes were gathered from various sources, including local cooks, friends and relatives of Jessica’s, along with many from Jessica herself. In addition to the delicious recipes the book is full of practical information. How to write an obituary. Writing condolence notes and thank you’s for funeral food. Advice pertinent to funeral food: send food in a non-returnable container, include a copy of the recipe along with your dish, along with reheating instructions. Extra advice: two small pans are better than one large one, how to keep hot foods hot and cold foods cold and many other useful tips and hints. Strangely enough this book makes for an interesting read, even if you are not looking for a recipe to help comfort someone you know that has experienced a loss. Next month you will find a blog post written for the companion book Food To Live For We’re Alive and Cooking. Both of these books can be purchased at the Old City Cemetery Visitor Center. They each cost $25.00, with all proceeds remaining at the cemetery. Old City Cemetery is located at 401 Taylor Street, Lynchburg, VA 24501. 434.847.1465 or www.gravegarden.org.